Update 10/21: I shared some quick reviews on this page of some items I recently tried on or received in the mail. 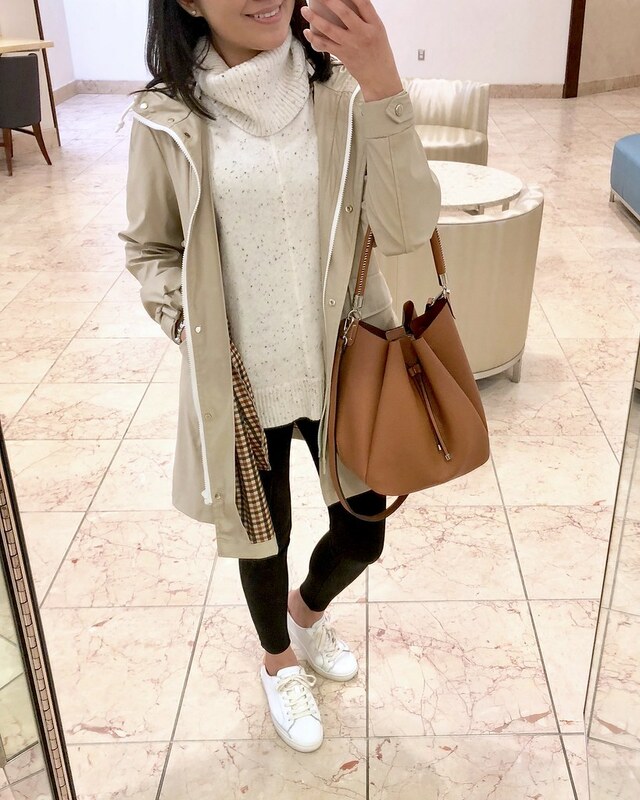 This hooded sweater was on my wishlist when I saw one at another store so I was excited when I found it in petites at another LOFT this weekend. The body is a very relaxed fit in my usual size XSP while the sleeves are very snug. I would size down but the sleeves are already too tight for comfort so I have to pass on this sweater. If you don’t mind an oversized fit then you may like this sweater but it does contain 28% wool in case you have sensitive skin. 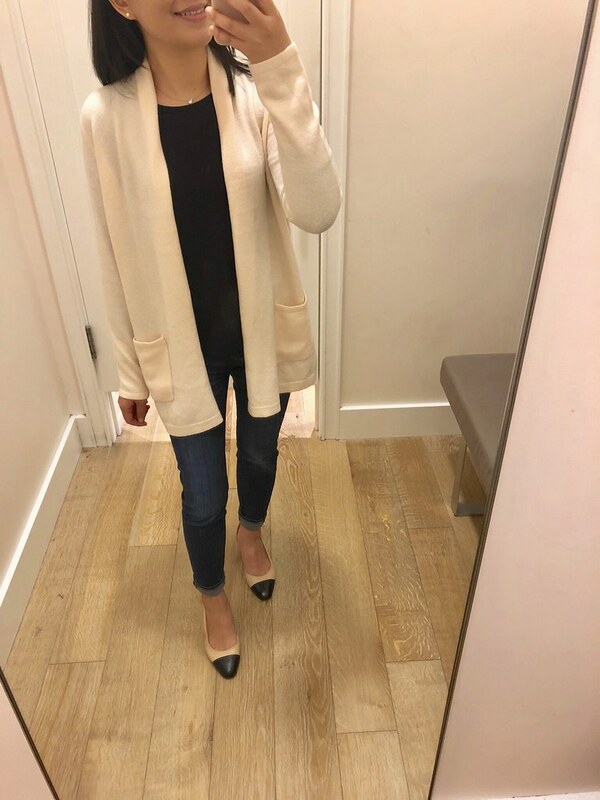 After multiple try-ons and purchasing camel and black in size SP I’ve come to the conclusion that the sleeves of this cardigan fit wider even in size XXSP (pictured above). I already repurchased black in size XXSP but now I’m hoping camel will also pop back in the smaller size so that I can repurchase that color as well. I’ll give size SP to my sister who is 5’7″ since it would fit her perfectly. 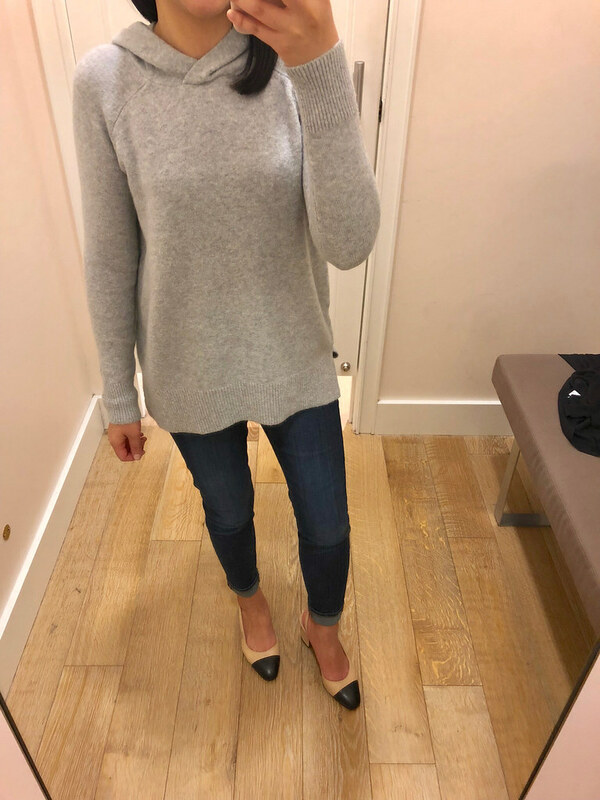 I tried on my usual size XSP last week here but the sweater was too loose so I found size XXSP to try on and it fits a lot better. Luckily sizing down is still a body skimming fit on me and I like the longer overall length. I like this shirttail cardigan but the sleeves are very snug and long in my usual size XSP. I would need to try a size up to see how much looser the sleeves are but then I would probably have to fold up the sleeves too. Update 11/7: My coworker loves this cozy cardigan and she mentioned that it washes well since it doesn’t contain any wool. 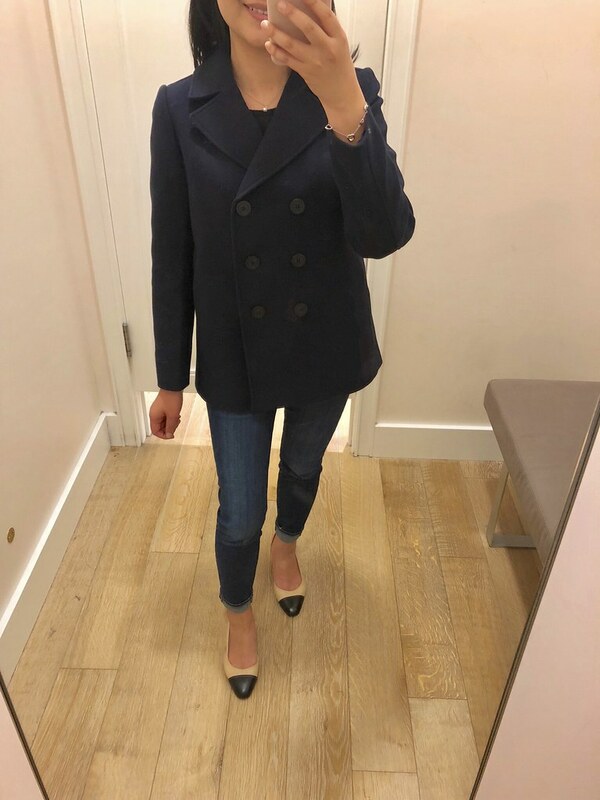 This peacoat is really cute but it does run larger and have a boxy fit which makes perfect for layering underneath. It’s mid weight so it’s not very warm on it’s own so it’s ideal for early fall or those that live somewhere where it doesn’t get too cold in the winter. It also comes in a camel color now which I haven’t yet seem in person. 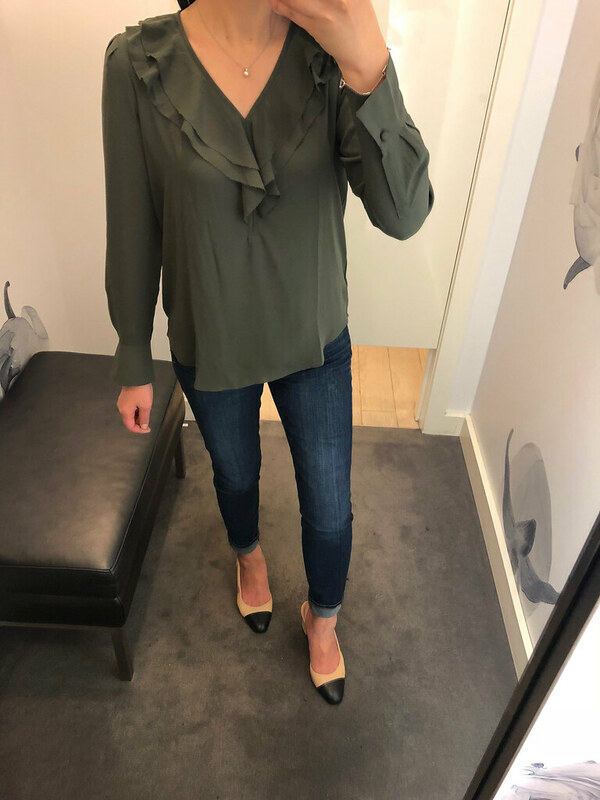 I found this olive color blouse in the sale racks but I don’t see the color online although it’s available in other equally beautiful colors for fall. My usual size XSP fit me well and I’m kicking myself for not getting it that day since I was hoping to wait for a bigger sale discount to buy it. Update 10/31: I ordered size XXSP but it’s a bit shorter in the overall length than I preferred so I returned it. I’ll need to keep an eye out for my preferred size to pop back in stock online. 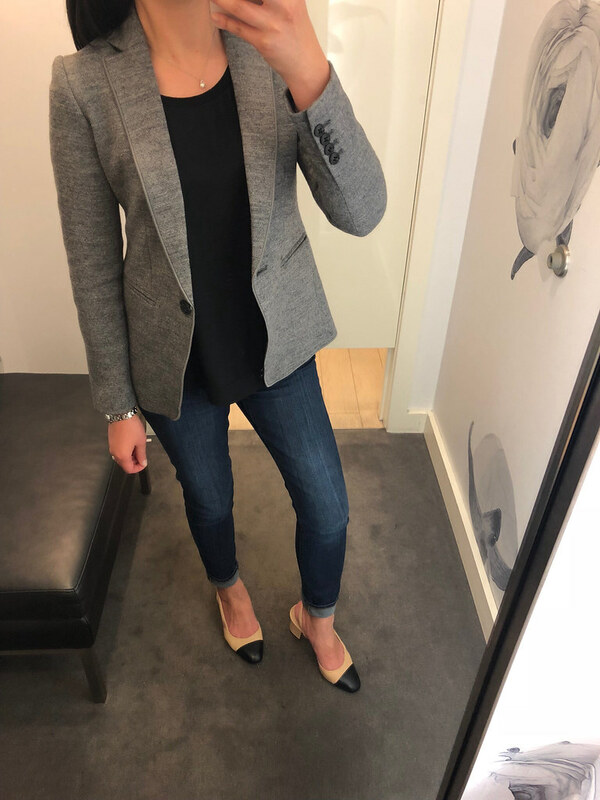 I love the clean, sleek lines of this grey fall blazer. I tried on size 00P which was much too snug so I probably need my usual size 0P. I like this coatigan which is a past season best seller. 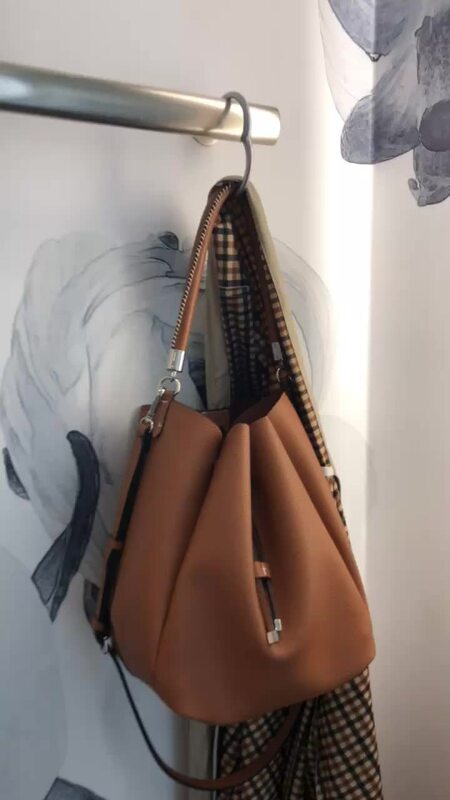 It’s really well made and cozy but it runs one size bigger so size XXSP fits more like size XSP or XXS regular. The pocket/pocket lining placement may not work for some as it may add unwanted bulk at the hips. 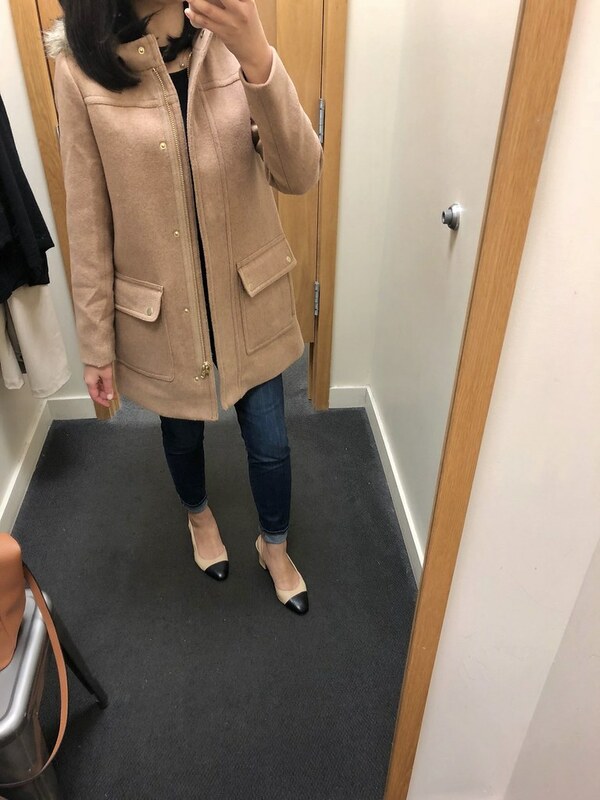 I sometimes worry about keeping the fitting room free of clutter for my selfies so I used my Clipa2 bag hanger to keep my jacket and bag out of sight. 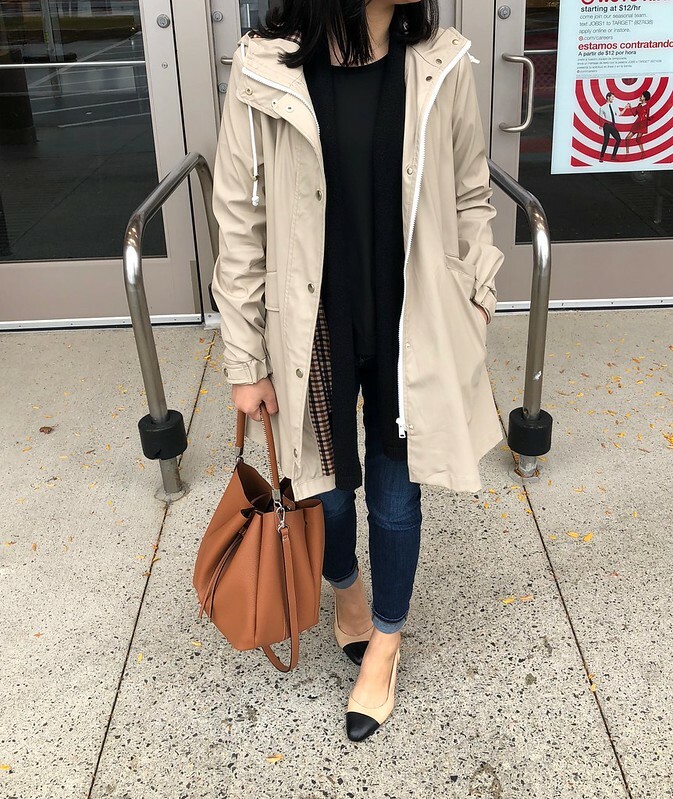 I love this new light raincoat I recently picked up from Zara and I wore all weekend. 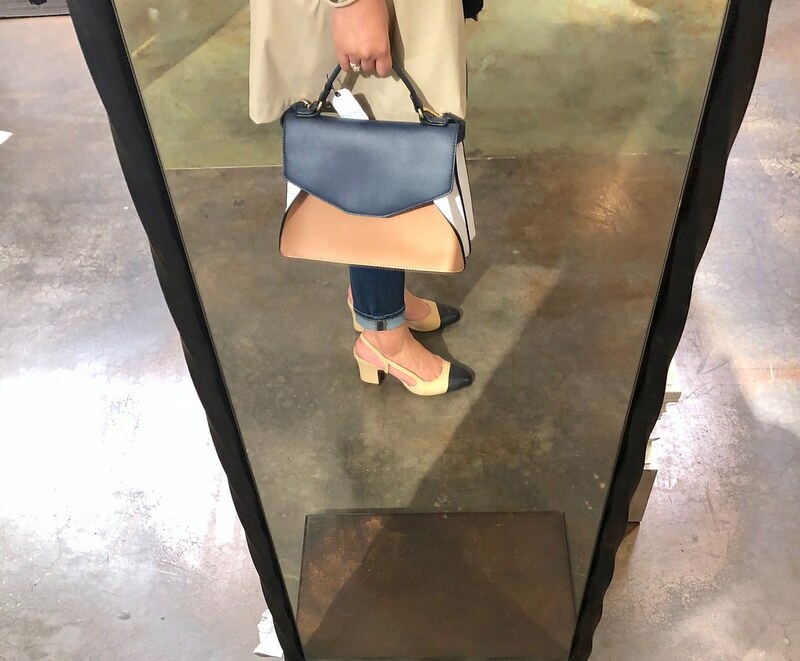 I love the color blocking of this $52 bag. It has a unique look that should be easy to match due to the three versatile colors. The bag also comes with a crossbody strap not pictured. 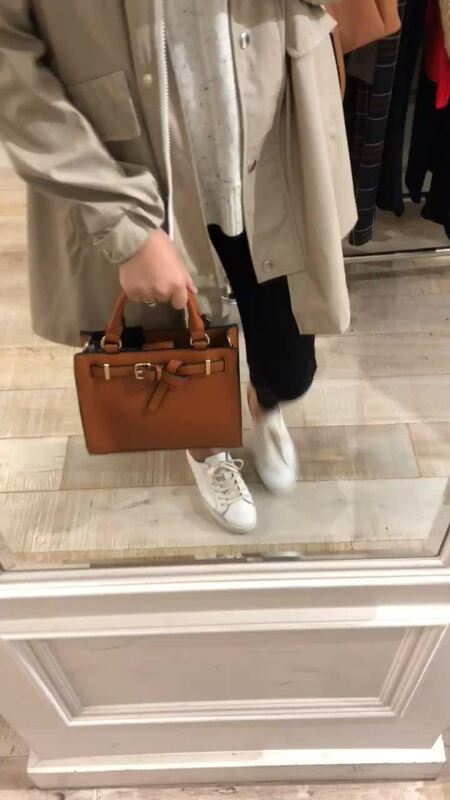 I spotted this $24.90 bag on display at Forever 21 and it’s a cute mini size if you’re looking for an affordable cognac option for the season. I thought the belt detail in front was very on trend. This bag comes with a crossbody strap not pictured. I like this heather saddle color which is a camel color in person. Size 00 fit me well it has 23.5″ sleeves and it’s 29.5″ total length. This is a mid weight swingy coat that’s perfect for layering underneath since it’s not particularly warm on its own. I also like the size of the faux fur hood and I prefer hoods over wearing hats which I would probably drop and lose in a hot second. Another coat I recently tried on is this seamless down short coat from Uniqlo which I fit in size S for a relaxed fit. Size XS fit me but it was too snug when I tried to zip it up. The length hit me mid-thigh. I apologize for the lack of pictures but I’ll try to take some next time I stop in store. My husband liked the mens version of the seamless down coat and he fit his usual size XL (he’s 5’11’ and 214). I’m not sure what is considered a good Uniqlo sale but I’ll be keeping an eye out. 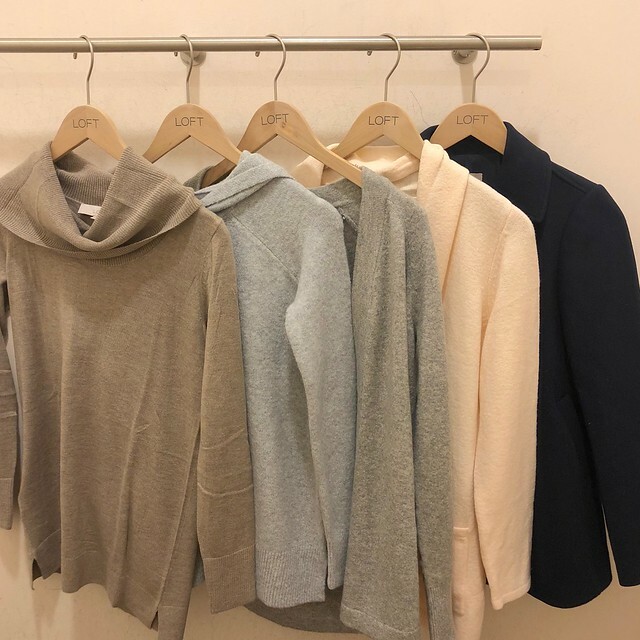 Update 11/4: I tried on size XS and S again yesterday and I was wearing a sweater vest instead of a chunky long sleeve sweater so it was easier for me to fit and zip up size XS. 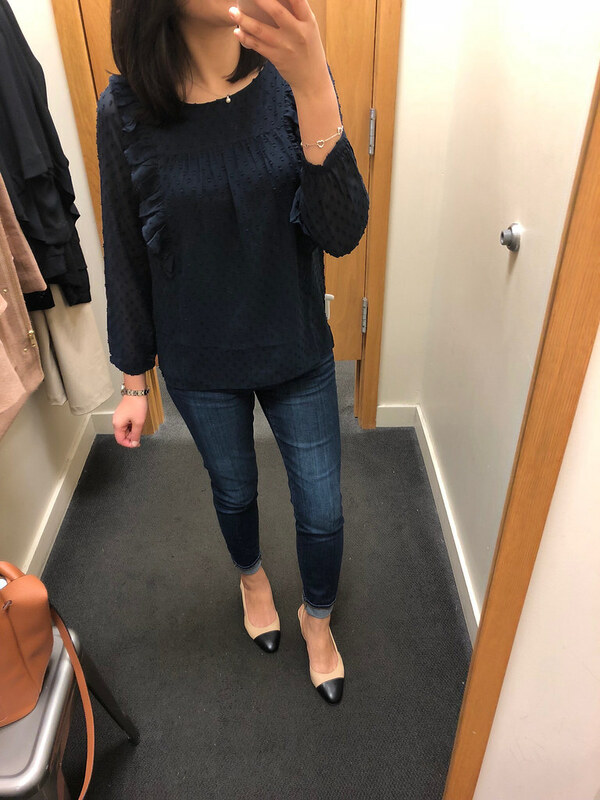 I liked this swiss dot blouse when I tried it on in store so I ordered it online in navy and grey since it was cheaper online ($29.50) this past weekend. J.Crew Factory is notorious for adjusting their prices so I’m not sure I got a great deal but it’s currently $34.12 today with code HURRY. The sleeves of size 00 are looser but I liked the slightly boxy fit. The top is lined so it’s not sheer. I ordered the grey color as well since I was curious why that color was selling out compared to the other two colors (navy and burgundy). Size 00 measurements are: 37″ chest, 39″ along the bottom hem, 20″ sleeves, 24″ total length. 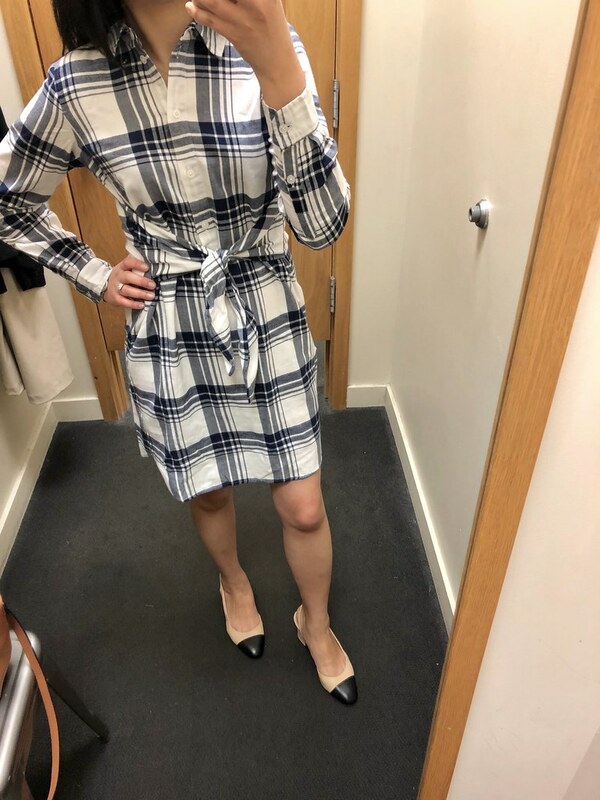 This plaid dress looked really cute on the hanger. I tried it on for sizing but I found the tie-waist detail to be awkward on me since the top of the dress is loose on my smaller chest. The dress has a shorter overall length making it petite friendly (again I’m 5′ 2.5″). The shirttail hem comes up even higher on the sides if you view the video clip I linked above so it’s a bit shorter than I prefer. 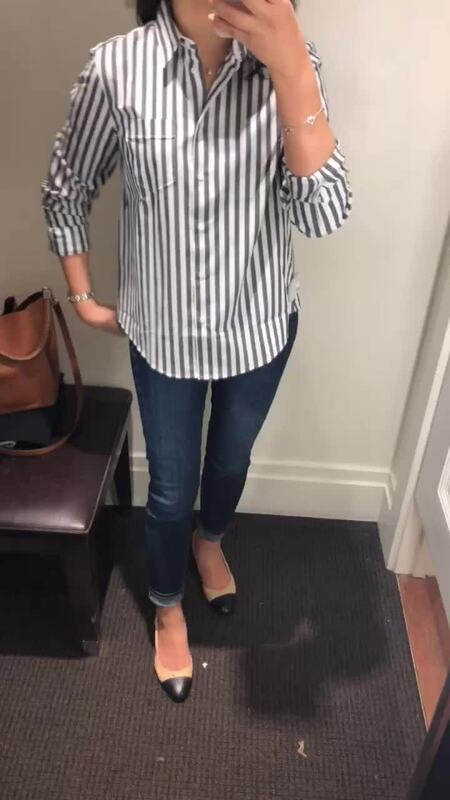 I liked the crisp white and grey stripes for this shirt. However, the shirt is very short and boxy for regular missy making it petite friendly. The sleeves are very loose and wide so they look best cuffed and pushed up. Size XS regular fits like how I would expect size small petite to fit. 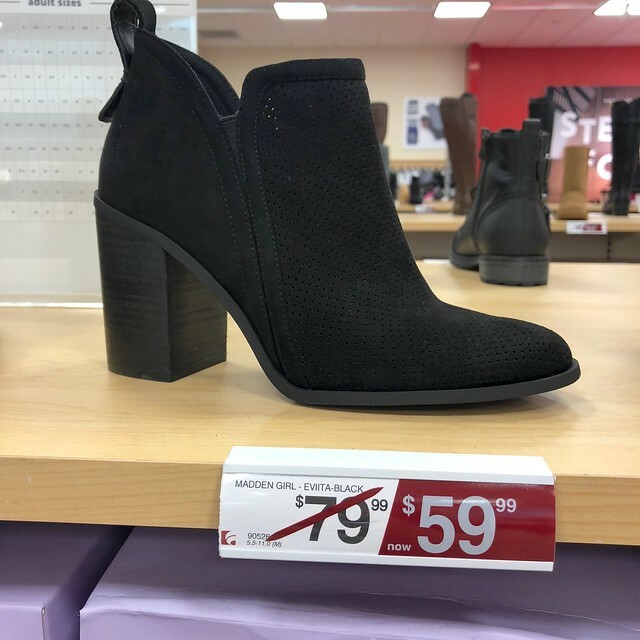 I saw these booties at Famous Footwear and I managed to squeeze into size 6.5 so I believe I need them in my usual size 7. They’re $59.99 at Famous Footwear but I found them on Boxcovs for $49.99 but I don’t have a store near me. If I order them I may pay more just to be able to return them in case I change my mind. 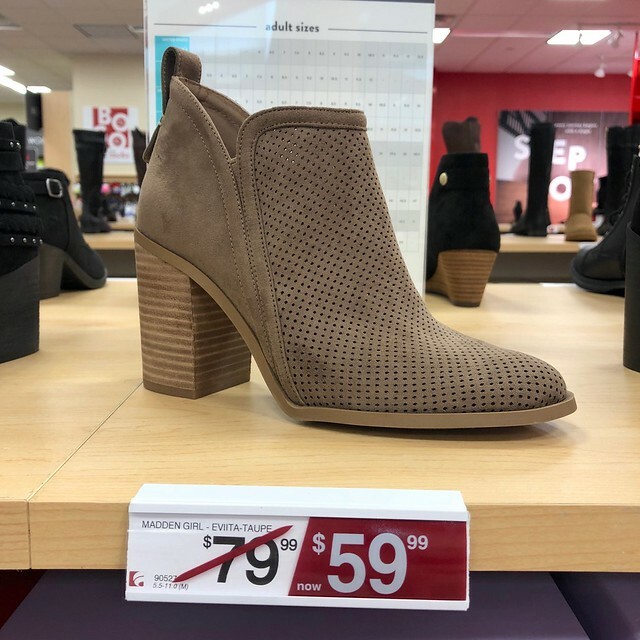 Update 10/19: Thanks to Kim for the heads up that Famous Footwear is on sale for 15% off (making these booties $50.99 after discounts) with code LOVE2SAVE. I ordered the taupe and black colors to try in my usual size. Update 10/23: I received the booties tonight and my usual size 7 fits well. The heels are 3.5″ and they are slightly narrow on my wider (right) foot but not uncomfortable. They are an almond toe so they’re not too pointy. The natural color of this plaid triangle scarf looks really cute. I wish there was a store closer to me so that I could use the in store pick up. I also like this plaid triangle scarf. I just received that tote you linked in the store today! It's incredible quality for a freebie. It's made of really sturdy canvas, has a key fob inside, 2 large inner pockets, a built in free hanging pouch that has zip pockets, a super sturdy plastic insert at the bottom and really sturdy faux leather handles. Seriously, I couldn't get over how amazing this tote is! @leesooim Thanks for sharing a review of the free tote! It does sound amazing and I hope there are still some left if I can stop by this weekend. Silly me already checked eBay to see if anyone was selling theirs. lol Sometimes I see their free canvas bags on sale on Poshmark too. Thanks Lilly! I know you're good sister. 😉 I need to swing by this weekend and I hope they have some totes left. Fingers crossed. I finally got a Cares card too so I hope they have some things in my size.